It is a bit of a cliché to say that an artist has forged their own language, but in Bodil Manz’s case this is certainly true. No other potter makes porcelain vessels that are remotely comparable to hers, so that our whole perception of the material is changed. Her paper-thin slip-cast pieces, like taut tissue and as light as egg shell, takes the material into another physical sphere, like the prismatic qualities of stained glass or a smooth translucent textile, as polished and silky as bone. The thinness of their walls are such that outer and inner surface decoration merge to create an integrated whole, with no uneasy separation of interior and exterior. The pot both contains and exudes light. Born in 1943 in Copenhagen, Manz studied ceramics at its School of Arts and Crafts (and subsequently at the University of Berkeley, California) in the early 1960s, establishing a workshop with her husband Richard Manz in 1967. Her Danish-ness is important. There is that understanding of light that comes out of a country of many islands and coasts set in different waters, from the Baltic Sea to the Kattegat, from the Skaggerak to the North Sea. Coastal Denmark is a place of varied atmospheres where the light shifts and changes. The painters of Skagen for example, on the northern tip of Jutland, made light a principal theme of their painting in the closing years of the 19th century. Manz’s pots are so receptive to shadow and light that they carry their own sense of movement, a kind of transformative inner life. 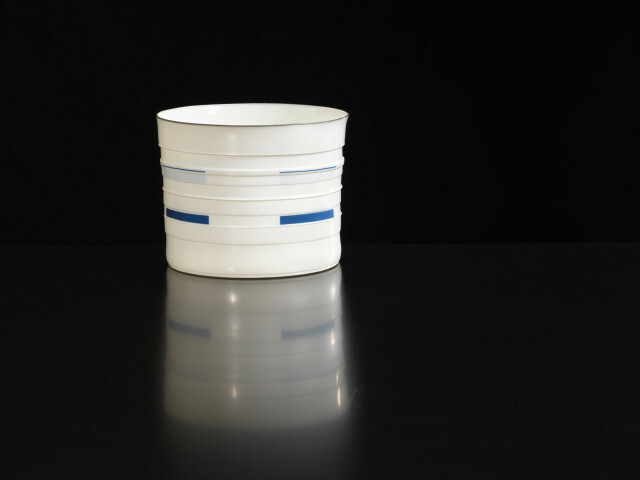 Her signature forms, cylinders of various width and height, are also very Scandinavian, expressing a Danish interest in a kind of elemental simplicity, enclosure and containment at its most direct (see for example the bold cylinders of Christian Poulsen, Gertrud Vasegaard or Inger Rokkjaer). But the variations Manz has produced over the years are extraordinary, marked out with meditative fields and grids of line and colour, many of which look like blueprints for modernist building structures, or meditations on late Mondrian. We also have to consider the influence of Vilhelm Lundstrøm (1893-1950), a Danish Cubist whose still lifes of bottles, jugs and flasks were just as much studies in geometry, linear harmonies in blocks of colour. Her pots are also particularly satisfying to see in conversational groupings. Manz’s work is a kind of controlled drawing in-the-round, a canvas stretched like a skin and shaped into something sculptural and ethereal. As much as anything else, this work is about rhythm, about repetition, variation and deviation, sometimes in the form too. Some of her structures are more complex, composite in shape, with echoes of Frank Gehry structures and potters like Alison Britton and Ken Eastman. Manz is clearly as indebted to the language of modernism, to making objects that refer to a world outside that of pure ceramics, and yet which also do much to celebrate its most essential language, that of the cylinder, and to push cast porcelain to its structural limits. Such work confounds expectations. Its translucency is so crisp, its comparative weightlessness always comes as a surprise. A familiar and basic form can in fact be anything but. Richard and Bodil Manz wrote in a joint statement about “Focussing and concentrating on a single object such as a sphere, a square, a cylinder, a cup, fundamentally something quite ordinary, the stuff of everyday life, indeed almost banal. But during the process we discovered fresh aspects, and suddenly ‘the ordinary’ becomes a new experience”. This sense of rediscovery echoes the philosophy of the late Gwyn Hanssen Pigott. She too liked the idea of pots, seemingly so straightforward, as catalysts of a quiet epiphany; “The way pots transform in light is something special to me because this reflects what we are as human beings, ordinary but with the possibility of joy”. Manz’s cylinders continue to to be a basis for broader experimentation, of ways in which she can investigate other types of structure. She can have a Cubist attitude to the container, breaking up her purer shapes to create complex pieces that look as if they have come out of the sketchbooks of de Stijl or the Russian Constructivists. Surfaces sometimes have freer, quite gestural drawing which shows how much Manz enjoys her liberations. She remains rooted in a domestic language. Pots such as hers get under the skin because of their intimacy, using a scale that connects so easily with our everyday lives. Objects of this beauty simply change a room, and add something luminous, metaphorically and literally, to our sensory perception.